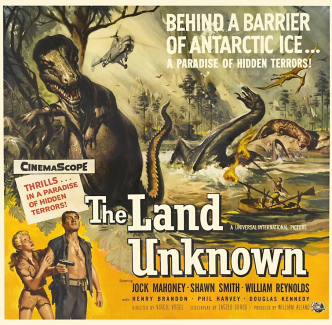 Description: Generous portions of The Secret Land, the 1948 documentary on the Byrd Antarctic Expedition, were worked into the action of The Land Unknown. Jock Mahoney and William Reynolds play Hal and Jack, leaders of an expedition to the South Pole. Along for the ride is girl reporter Maggie (Shawn Smith), over whose affections Hal and Jack constantly battle. Making a forced landing in the Antarctic, our intrepid explorers find that they've descended well below sea level. 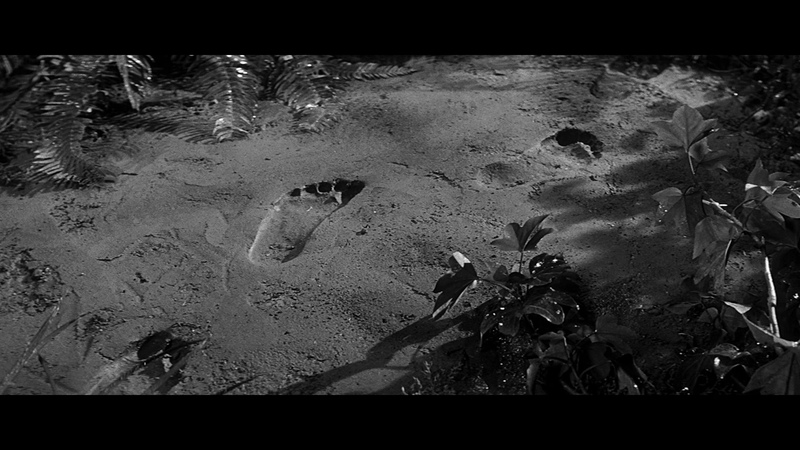 Before long, they are attacked by prehistoric beasts which have been preserved in this heretofore uncharted region. 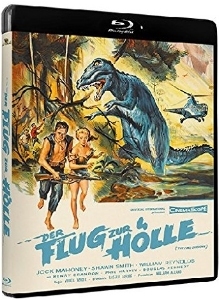 When not fending off Tyrannosauri and Pterodactyls, Hal, Jack, Maggie and copter pilot Steve (Phil Harvey) try to steer clear of an unwieldly carnivorous plant. Further complicating things is the presence of a long-lost, slightly demented scientist (Henry Brandon) who craves companionship...specifically the female companionship of Maggie. 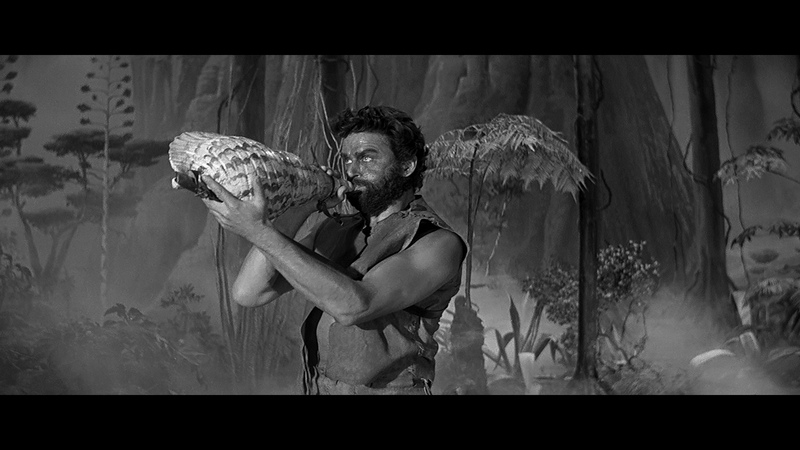 Superior special effects make this fantasy adventure a respectable endeavor. 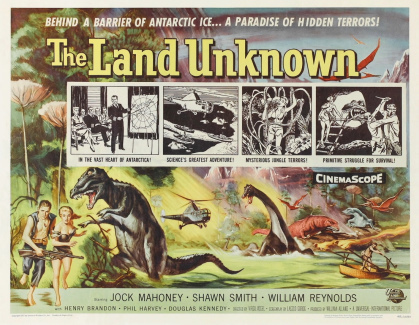 Mahoney heads an expedition to the Antarctic, but his helicopter is damaged when it collides with a giant flying bird. 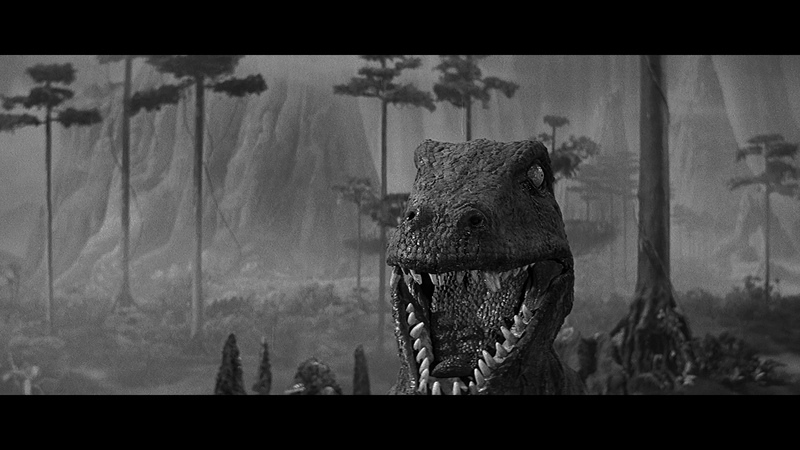 The group is forced to land in a place inhabited by creatures from the Mesozoic Era. Also stranded there is Brandon, a scientist from an expedition made 10 years earlier. He has gone insane during his stay, but has somehow managed to survive. The parts from his disabled helicopter allow the stranded crew to repair their own and to return to civilization. Well-directed, with believable performances, including that of Brandon, who was an actual member of Adm. Richard Byrd's 1947 South Pole expedition. 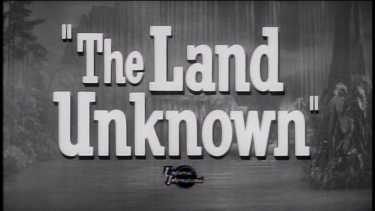 The Land Unknown is helmed by longtime TV director Virgil W. Vogel ("The Mole People"). 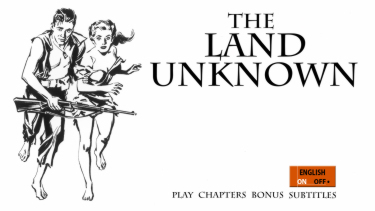 It's based on the story by Charles Palmer and is written by Laszlo Gorog and William N. Robson. Former stuntman Jock Mahoney stars and does his own stunts. 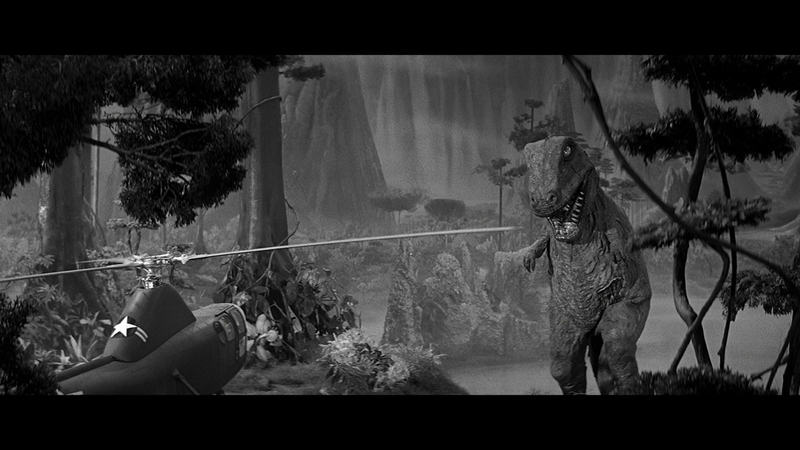 Though the special effects can't compare to those of recent sci-fi films such as Jurassic Park, nevertheless they're reasonably convincing all things considered. 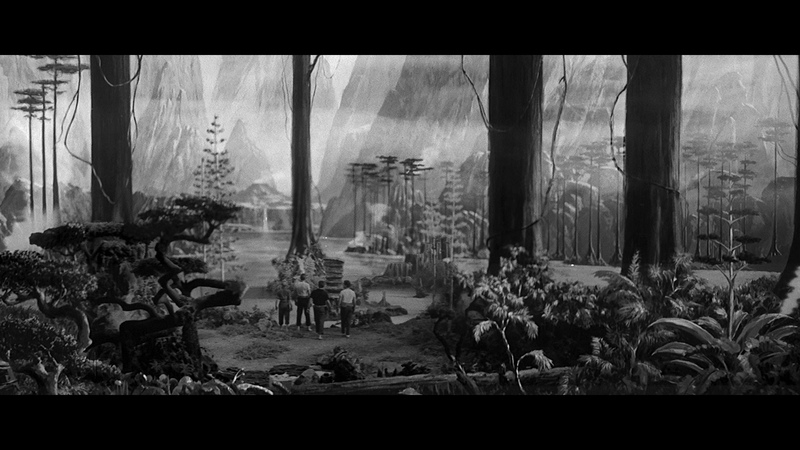 The special effect gurus, Fred Knoth, Orien Ernest and Jack Kevan, had the plants growing upside down that gave it that pre-historic look and thereby created just the right atmosphere to keep things credible. A US Navy expedition goes to explore the South Pole. 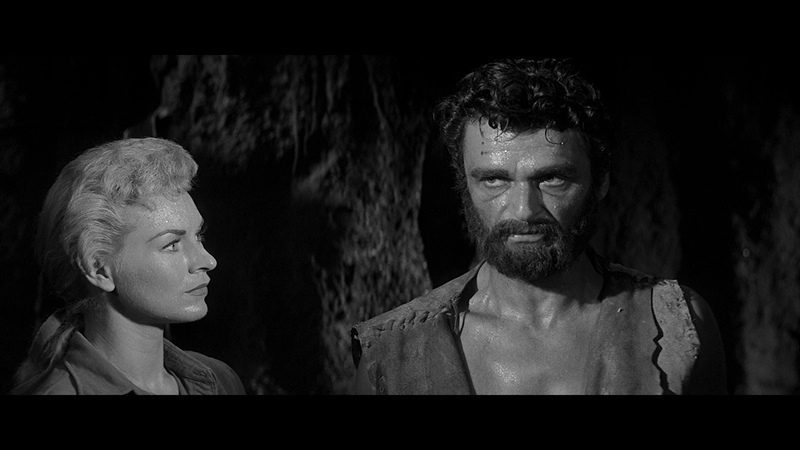 Commander Harold Roberts (Jock Mahoney), a geophysicist, leads the mapping and resource search expedition. 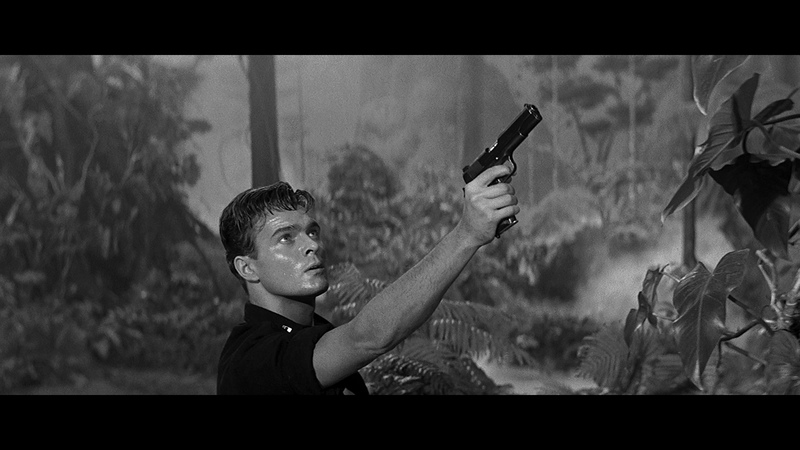 Lt. Jack Carmen (William Reynolds) is the helicopter pilot. 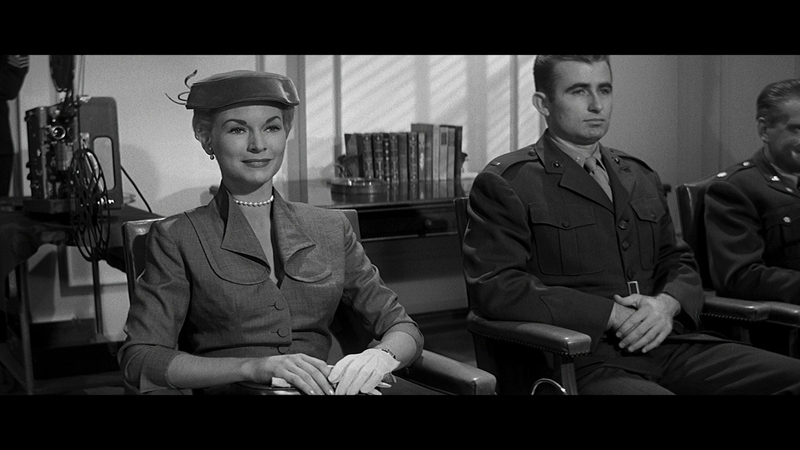 Pretty Margaret Hathaway (Shawn Smith, the former Shirley Patterson) is the lone female among 800 men, who is an investigative reporter for a science magazine. Steve Miller (Phil Harvey) is a machinist and co-pilot. 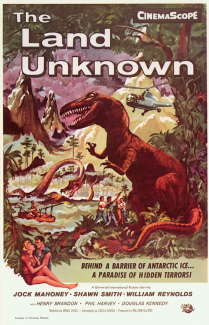 When the helicopter these four are on is forced down because of a storm into a volcanic canyon, they find themselves stuck in a steamy tropical valley that is untouched by the Ice Age, where dinosaurs such as Tyrannosaurus Rex (just a guy walking around in big inflated rubber suit, that's too clumsily created to be frightening) from the Mesozoic era still roam. 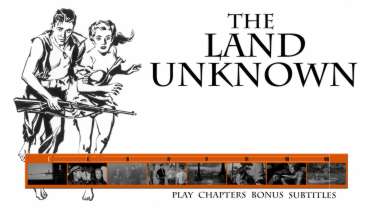 The new German Blu-ray of The Land Unknown is the aspect ratio of 2.35:1 as it was on DVD in the The 6-disc Classic Sci-Fi Ultimate Collection. We've added a couple of capture comparisons below. You can see the 1080P is brighter and crisper with more layered contrast. I saw a few artifacts (in the fog) at around 15-minutes, but otherwise seemed like a strong transfer. This is single-layered but has a very high bitrate for the 1 1/4 hour film. There is a touch of depth and looks quite pleasing in-motion. Visually this gets high marks. The Kino is also single-layered and has very similar technical statistics. I can't tell much o0f a difference at all with the Anolis transfer image quality. Audio is transferred via a DTS-HD Master 2.0 channel at 1592 kbps in original English and a similarly robust German DUB. 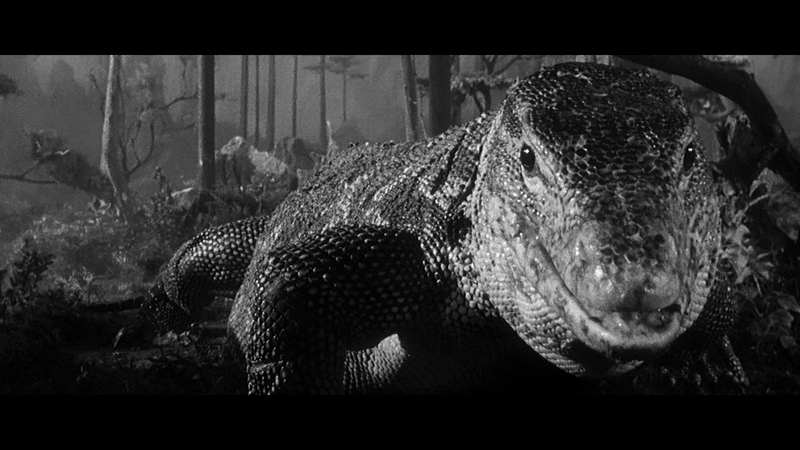 There are some robust effects with the creature's roars, growls and grunts. 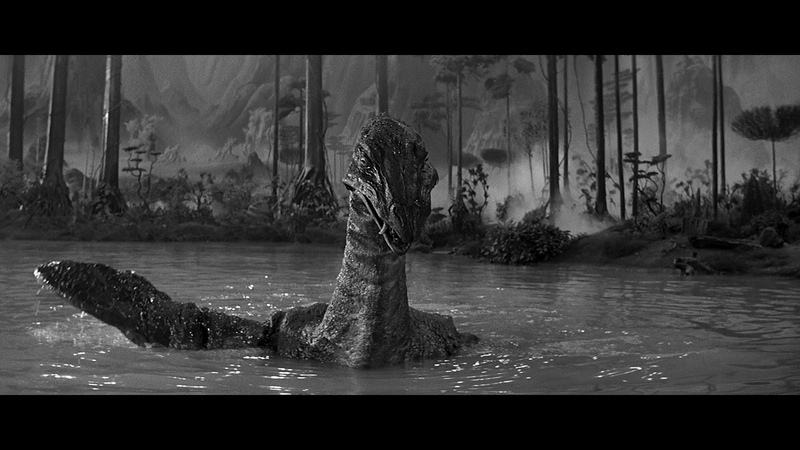 It's not Jurassic Park but the audio made me think of Spielberg's dino-flic. The score is by an uncredited collaboration piece-meal of Henry Mancini, Heinz Roemheld, Hans J. Salter, Herman Stein. 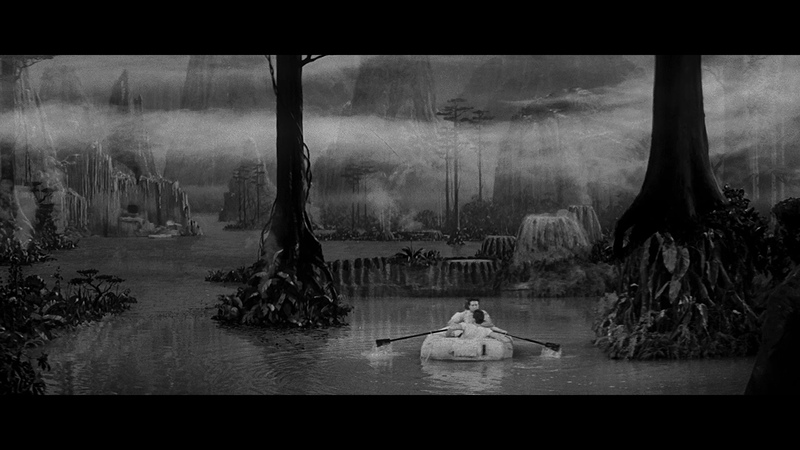 It supports the film playing in the background but doesn't seem to advance much in lossless. 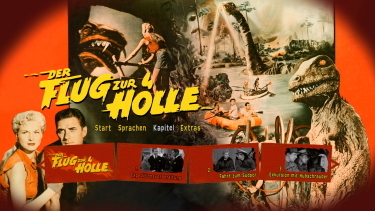 There are fully optional German subtitles and my Oppo has identified it as being a region 'B'-locked. Ditto for the audio - same encode (DTS-HD Master) and no differences. 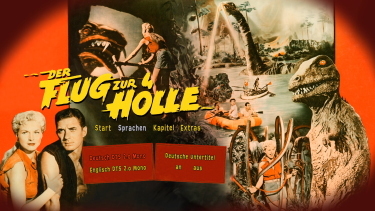 The Kino does offer optional English subtitles and is Region 'A'-locked. 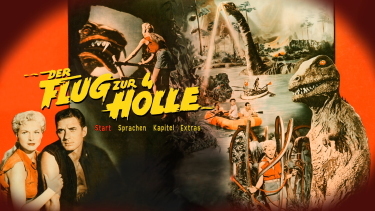 Not much - a slideshow gallery, two trailers and the scanned German program text. 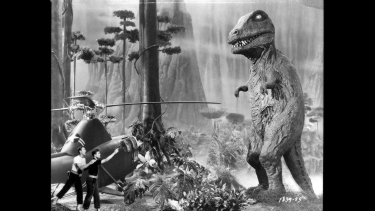 I'm sure there is something to be said about the film - even in a 'Mystery Science Theater 3000' sarcasm way. The Kino has a commentary and for what I listened to (about 1/2) there was only one person (David Schecter) - who does not introduce themselves. He is somewhat funny, there is a lot of read narration, quotes (from ex. Tom Weaver) and a interview pieces - with director Virgil Vogel and others. 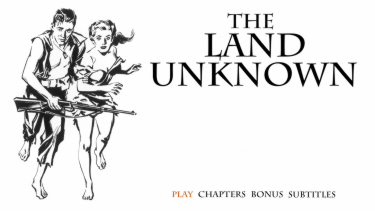 It identifies the production weaknesses - extensive amount spent on the monster effects and the lack of enthusiasm for those involved in The Land Unknown. Bottom line is that it has value with factoids and humor plus there is a photo gallery and trailers. 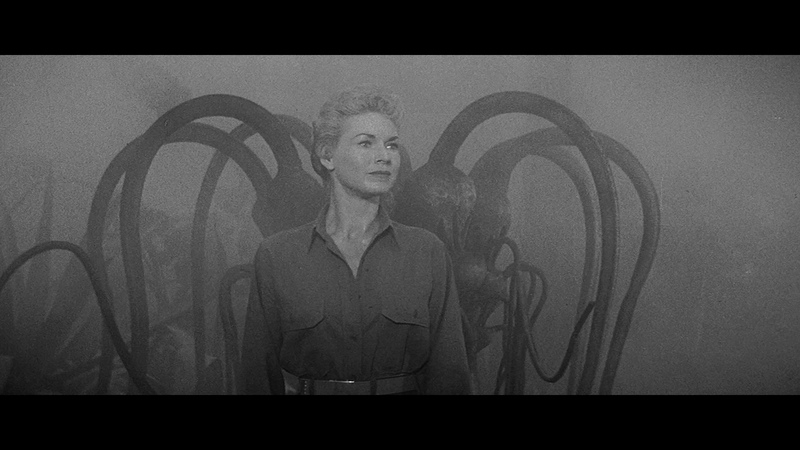 If I don't say it enough, I'm a huge fan of these 50's 'creature-feature' science-fiction films. I watched these every Saturday afternoon as a young boy. I won't disagree that this is a lesser effort but I still enjoyed the premise, effects and characters. 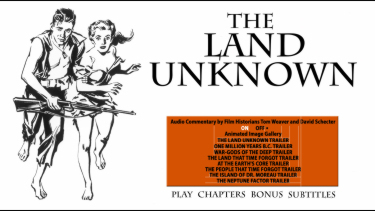 The Blu-ray advances the presentation - notably in the audio as well as the video. Kino wins with the addition of the commentary. 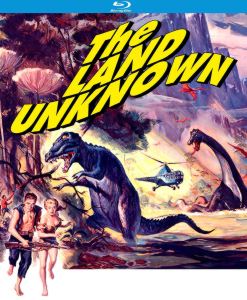 It has the nostalgia appeal along with Tarantula, The Mole People and The Monolith Monsters Blu-rays I'm very pleased to own this in the higher resolution, with commentary, and hope more similar 50's science-fiction films continue to be forthcoming.